Was it really six years ago that I first blogged about the Academic Journal Racket which siphons off millions from hard-pressed research budgets into the coffers of profiteering publishing houses? Change is coming much more slowly over the last few years than I had anticipated when I wrote that piece, but at least there are signs that other disciplines are finally cottoning on to the fact that the old-style model of learned journals is way past its sell-by date. This has been common knowledge in Physics and Astronomy for some time, as I’ve explained many times on this blog. But, although most wouldn’t like to admit it, academics are really a very conservative bunch. Question: How many academics does it take to change a lightbulb? This contains fairly old data (up to 2009) but I strongly suspect the effect is even more marked than it was six years ago. I’d take the argument further, in fact. I’d say that journals are completely unnecessary. I find all my research papers on the arXiv and most of my colleagues do the same. We don’t need journals yet we keep paying for them. 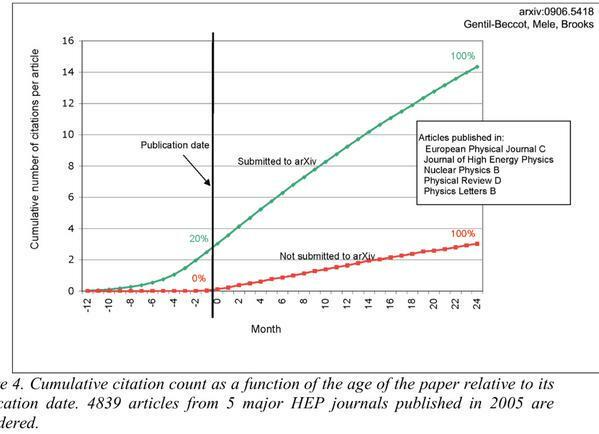 The only thing that journals provide is peer review, but that is done free of charge by academics anyway. The profits of their labour go entirely to the publishers. Fortunately, things will start to change in my own field of astrophysics – for which the picture is very similar to high-energy physics. All we need to do is to is dispense with the old model of a journal and replace it with a reliable and efficient reviewing system that interfaces with the arXiv. Then we’d have a genuinely useful thing. And it’s not as far off as you might think. My (probably ill-informed) earlier post about particle physics seems to have generated quite a lot of traffic, so I thought I’d reblog this short article (by a real particle physicist) for the benefit of those people who want to find out about the latest results from someone who actually knows what they’re talking about.